Here are some snazzy birthday facts about 10th of February 1974 that no one tells you about. Don’t wait a minute longer and jump in using the content links below. Average read time of 10 minutes. Enjoy! What day was my birthday Feb 10, 1974? February 10, 1974 was a Sunday and it was the 41st day of the year 1974. It was the 6th Sunday of that year. The next time you can reuse your old 1974 calendar will be in 2019. Both calendars will be exactly the same! This is assuming you are not interested in the dates for Easter and other irregular holidays that are based on a lunisolar calendar. What day was February 10 this year? There are 293 days left before your next birthday. You will be 46 years old when that day comes. There have been 16,508 days from the day you were born up to today. If you’ve been sleeping 8 hours daily since birth, then you have slept a total of 5,503 days or 15.07 years. You spent 33% of your life sleeping. Since night and day always follow each other, there were precisely 559 full moons after you were born up to this day. How many of them did you see? The next full moon that you can see will be on May 18 at 21:13:00 GMT – Saturday. Fun stat: Your first one billion seconds (1,000,000,000) happened sometime on October 19, 2005. 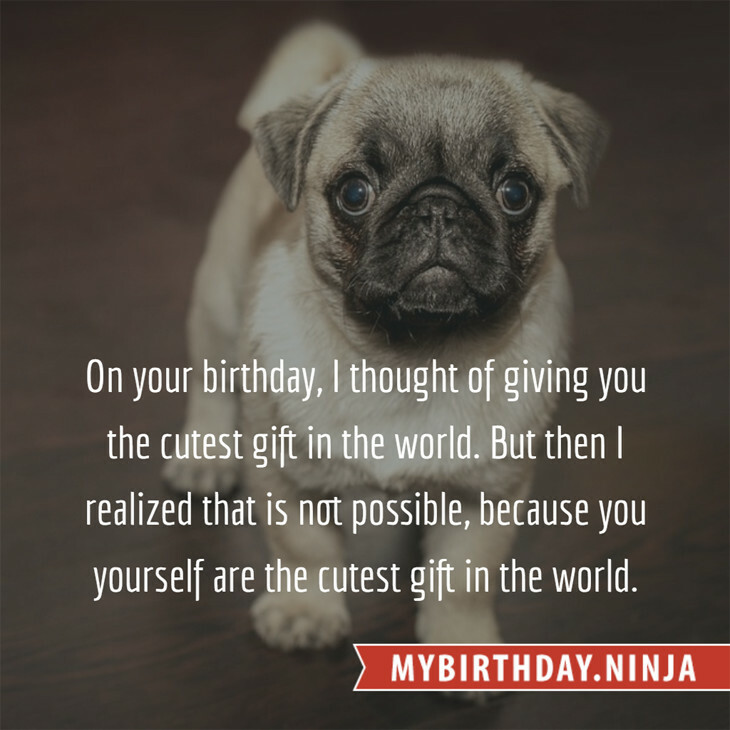 If a dog named Sergeant - a Japanese Chin breed, was born on the same date as you then it will be 200 dog years old today. A dog’s first human year is equal to 15 dog years. Dogs age differently depending on breed and size. When you reach the age of 6 Sergeant will be 40 dog years old. From that point forward a small-sized dog like Sergeant will age 4 dog years for every human year. View the complete list of February 10 celebrity birthdays. Who are the famous February 10 birthdays? Here’s a short list of famous people in history who were born on Feb 10. View the complete list of February 10 famous birthdays. 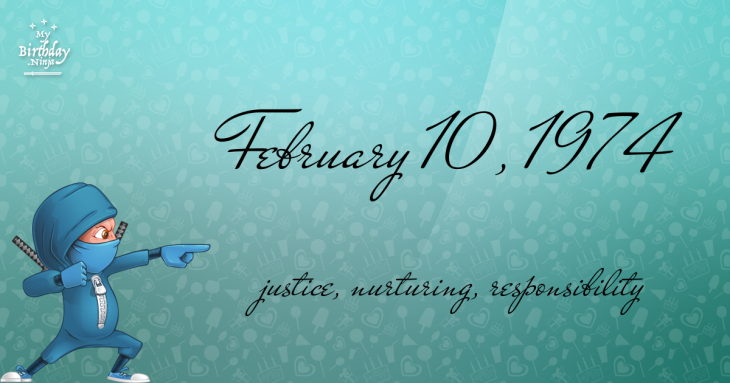 What happened on my birthday – Feb 10th? Baghdad falls to the Mongols, and the Abbasid Caliphate is destroyed. French and Indian War: The Treaty of Paris ends the war and France cedes Quebec to Great Britain. Second Italo-Abyssinian War: Italian troops launched the Battle of Amba Aradam against Ethiopian defenders. The first gold record is presented to Glenn Miller for “Chattanooga Choo Choo”. Roy Lichtenstein’s first solo exhibition opened, and it included Look Mickey, which featured his first employment of Ben-Day dots, speech balloons and comic imagery sourcing, all of which he is now known for. The IBM supercomputer Deep Blue defeats Garry Kasparov in chess for the first time. Voters in Maine repeal a gay rights law passed in 1997 becoming the first U.S. state to abandon such a law. The communications satellites Iridium 33 and Kosmos 2251 collide in orbit, destroying both. View the complete list of February 10 historical events. What does my birthday February 10, 1974 mean? Your birthday numbers 2, 10, and 1974 reveal that your Life Path number is 6. It represents justice, nurturing and responsibility. You possess great compassion and seek to be of service to others. The following celebrities also have the same life path number: Lauren Alaina, Ennio Girolami, Kim Zimmer, Babydaddy, Lisa Guerrero, Shelley Ackerman, Bryce Dallas Howard, George Burditt, John Nolan, Jacques Brel. What is the birthday horoscope for Feb 10, 1974? The Western zodiac or sun sign of a person born on February 10 is Aquarius ♒ (The Water-bearer) – a fixed sign with Air as Western element. The ruling planet is Uranus – the planet of originality. According to the ancient art of Chinese astrology (or Eastern zodiac), Tiger is the mythical animal and Wood is the Eastern element of a person born on February 10, 1974. What is the birthstone for February 10? Fun fact: The birth flower for 10th February 1974 is Violet for modesty. What is the Love Match for Feb 10, 1974? When it comes to love and relationship, you are most compatible with a person born on January 28, 1998. You have a Love Match compatibility score of +175. Imagine being in love with your soul mate. On the negative side, you are most incompatible with a person born on August 17, 1955. Your incompatibility score is -154. You’ll be like a cat and a dog on a love-hate relationship. Arf-arf, I want to bite you. Meow-meow, stay away from me! What is a good birthday trivia for February 10? The number-one hit song in the U.S. at the day of your birth was The Way We Were by Barbra Streisand as compiled by Billboard Hot 100 (February 16, 1974). Ask your parents if they know this popular song. How many babies were born on February 10, 1974? Base on the data published by the United Nations Population Division, an estimated 121,673,775 babies were born throughout the world in the year 1974. The estimated number of babies born on 10th February 1974 is 333,353. That’s equivalent to 231 babies every minute. Try to imagine if all of them are crying at the same time. What is the popular baby name on 10 Feb 1974? What’s your bizarre Florida Man story? The #FloridaManChallenge is breaking the Internet and social media. Some crazy men, women, or creatures from the Sunshine State are making headlines every day of the year including your birthday. Try this fun exercise. Pick your search engine of choice and type in “florida man February 10” and see what kind of wild news headline you will get. This viral craze started in 2013 and gets resurrected now and then. The latest was from Tumblr and found its way to Twitter. As they say, the rest is history. Here’s a quick list of all the fun birthday facts about February 10, 1974. Celebrities, famous birthdays, historical events, and past life were excluded. Try another birth date of someone you know or try the birthday of these celebrities: November 30, 1987 – Christel Khalil, American actress; January 21, 1954 – Idrissa Ouedraogo, Burkinabé director, producer, and screenwriter; February 20, 1943 – Carlos, French singer and actor (d. 2008).